Apple on Thursday resumed operations of iTunes Connect, with the developer portal reopening a day ahead of schedule following a brief closure for the holidays originally scheduled for Dec. 21 to Dec. 28. Following up from his tip earlier in November, AppleInsider reader Gregg furnished a screenshot of the now active iTunes Connect, which returned to service on late Thursday after a six-day winter closure. 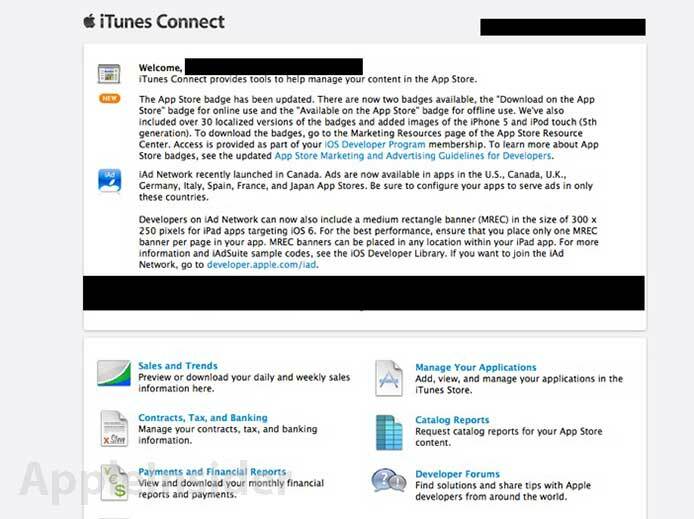 iTunes Connect is Apple's developer portal for managing apps sold through the App Store, including updates, pricing, and descriptions. The service also grants developers access to daily and weekly sales trackers, contract management and financial reports. Thursday's iTunes Connect reactivation mirrors 2011's, when the portal was returned to service a day earlier than its scheduled reopening date of Dec. 29.